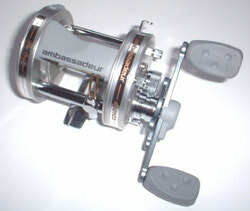 With all the ultramodern multipliers on the market for lure fishing these days, how come I use a reel that has been around almost unchanged since the 1950s - the good old Abu Ambassadeur? One main reason, I guess. They do the job! That's not all though. For a start they are available in left hand wind in a size that holds enough of the strength of line I want to fish with. Too many of the modern lhw reels are too small. There are other reasons. The 6501 size, which I use most of the time, doesn't have a Thumbar spool release. This feature is becoming almost universal on baitcasters these days. If you are fishing straight retrieve lures a Thumbar is not much of a problem. However, I find it causes trouble for me when twitching or jerking lures - and when playing fish. It is all too easy to accidentally release the spool with your thumb. Releasing the spool as you jerk a lure throws coils of loose line up which can be extremely annoying. Thumbing the reel as a fish takes line against the drag gives good control, but if that spool is inadvertently put out of gear by pressure from your thumb on the bar... I am sure you can guess the rest! As I like to keep my thumb resting lightly on the spool all the time while casting, retrieving and playing fish, I also appreciate the access to the top of the spool that Ambassadeurs afford. At least they do when you remove the plastic thumb rest and sling it away! Original Ambassadeurs never had this feature, and although some people like its presence I can't be doing with it. I don't want to have to use just the tip of my thumb to control the spool, either during the cast or when playing a fish, I want as much of my thumb as possible in contact with the line on the spool. What else do Ambassadeurs have going for them? Well they have a levelwind that is permanently engaged. I have found that a disengaging levelwind tends to bunch the line in one spot when the retrieve starts, or it causes undue friction during the cast by staying in one place. Free-floating line guides should eliminate these problems, but I have yet to see one that works as it is intended to. Stick with a levelwind that follows the line across the spool during the cast and I guarantee you will have smoother casts and no problems with line bunching or bedding in - unless the pawl in the levelwind is worn. Carry a spare pawl or two and that is easily remedied. I have heard people moan that the the levelwind has stopped working on their Ambassadeur as if it is a fault with the reel. Watch how fast it travels back and forwards during the cast sometime, and you will realise that wear is guaranteed. Do you expect the tyres on your car to last forever? While the main reason I opt for the 6501 size Ambassadeurs is the line capacity, I also feel that they cast a little better than the 5501 size. I haven't bothered trying to prove this. So don't quote me. 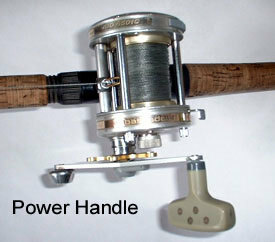 The line level falls less on the larger reel when casting, which keeps the retrieve speed up and is another plus point. I admit that when the palming grip is used the 6501 can be a bit of a handful, but it's not as much a handful as the 7001! The modern design with the rounded side plate is certainly more comfortable than the original style. I like to keep one grip on the rod and reel all day as I find this most effective. Changing grips between casts wastes what must add up to minutes of time during the day, so keeping the same grip must surely add a few extra casts each day. Swapping hands to fish with a right hand wind reel would waste even more valuable 'lure in the water' time! The one time I am known to switch to a 5001 size reel is for jig fishing. This method uses finer lines that are easily handled by a reel of this size, and the one I use, a 5601C4W, has another benefit a 3.8:1 ratio. Unfortunately it also has a Thumbar....... For most techniques the now standard 5.3:1 ratio is a good compromise, but it does lack winching power at times, and is a little slow for taking up the slack when jerkbaiting. Because parts are interchangeable on so many Ambassadeurs there are ways to overcome both these problems without too much hassle. You can fit replacement gears, or simply fit alternative handles. Fit a power handle and you get increased cranking power for fishing big lipped crankbaits or hard to retrieve spinnerbaits. Fit a short paddle handle and you can take up the slack more quickly. I have had a power handle on one of my Ultracasts for a few years now, and despite warnings from worry-guts the gears haven't stripped yet! If you want real cranking power have a look at the larger 7001. I would advise against the purchase of a fast retrieve Ambassadeur for general use. They have been available with a 6.3:1 ratio - 6501C4 and others. I find them to be a nightmare to use with large lures. Except for baits that offer very little resistance when retrieving them there is simply nowhere enough cranking power available. Some folks like these fast reels for working jerkbaits, or using other techniques that create slack line, but if you want reels that can do more than one job high speed reels are best avoided. There is, therefore, just one choice to make these days in a casting reel. Which model of Ambassadeur to select? Since the Ultracasts which I used for many years are no longer manufactured the choices are for the UK angler ar between the C3, C4 and JB models. Other models are available from overseas suppliers, some with fewer bearings. These might suit your budget better, and can always have bearings added at a later date. Find out more about modifying Ambassadeurs on the customising page. One good thing about Ambassadeurs is that spares are usually available for models that are out of production - some, like the levelwind components, have been standard across the range for many years. So if you are on a tight budget buying second-hand is a worthwhile option. This might not produce a reel that will have collecting value (some parts have changed cosmetically despite the part number being the same), but will give you a perfectly serviceable piece of fishing equipment. Could the classic Ambassadeur be improved upon? Of course. That's why folks customise them - click here for the specs to my ideal 6501! Is there a better lhw production reel available? Probably, but there isn't a better workhorse reel around that will still be capable of being serviced in twenty years time.... Ambassadeur - the AK47 of baitcasters! For an introduction to fishing with multipliers go to Lure Casting for Pike.